There was a time when it appeared that the Warriors would make centers obsolete. But over the last five years big men have evolved, found a way to stay on the court and created their own revolution. Perhaps the most interesting consequence of the current stretch of Warriors dominance in the NBA is how much the team’s offensive system bended the wills of everyone else in the league. Not only Golden State’s direct opponents, but pretty much every team that wanted to be considered a legitimate threat had to have an answer to the Death Lineup, first the Harrison Barnes version, and then the injected-with-Chemical-X Kevin Durant version. For some teams, this meant playing small, using traditional power or small forwards at center so their defenses could more easily switch as the Warriors turned them into a pretzel. Other teams eschewed bulk at the five spot, and instead relied on bigs who were nimble, keeping height at the position through someone fast-footed enough to (attempt to) guard Stephen Curry in a late shot-clock situation. Of course, no team has exactly had an answer for the Warriors. But the effects of Golden State’s style of play were widespread. During the playoffs, centers in both conferences—but particularly the West—often became an afterthought. The real game didn’t start until both teams went small. Centers who simply ran hard from rim to rim and did nothing but set screens and catch lobs—basically staying out of the way—became more valuable than ever. The Warriors kicked the speed and spacing revolution into high gear, and teams carrying too much bulk couldn’t achieve light speed. And yet somehow, as the 2019 postseason rapidly approaches, “Big ball” appears ready to make one last stand. For a league that’s deprioritized the center position for most of this decade, there are suddenly a bunch of awesome ones around the league. Nikola Jokic in Denver. Joel Embiid in Philly. Heck, the Warriors themselves start Boogie Cousins. Brook Lopez has been a key player for the best-in-the-league Bucks. There’s also Steven Adams and Rudy Gobert, and there was Jusuf Nurkic before his recent injury. What’s slightly started to change this season is teams who are successful can still use a seven-footer (or more traditional-looking big) as a big part of their offense. 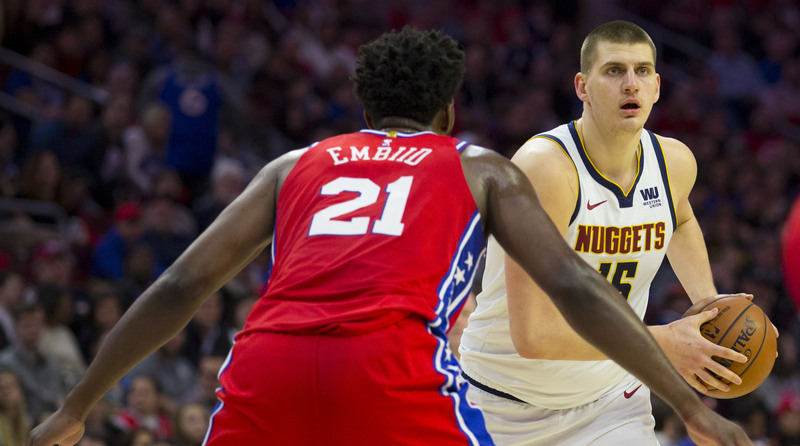 Of course, guys like Jokic, Embiid and Cousins are far from traditional. Jokic is undefinable, and rather hilariously works effectively as a ball-handler in pick-and-rolls, something Cousins also did often in his heyday. (Imagine Shaq calling for Kobe to set him a screen at the top of the key.) Embiid will bruise in the post but also likes to float around the three-point line. Lopez is still good for a bailout bucket on the block every now and then, but his utility is mostly derived from being a spacer for Giannis. (Imagine Ben Wallace waiting on the right wing as Chauncey Billups surveyed the floor.) Essentially, the small-ball shift of the last five years has forced big men to get creative, and guys who were once seen as unicorns are now starting to pop up more often, resulting in some sort of catdog hybrid of old and new. Stylistically, teams still want to play small, with spacing, shooters, and ball-handlers at every position. But instead of leaving that only to players 6’9” and under, the centers of yesteryear are now getting in on the fun. What does all of this mean, though? Is it just fun and games for a chubby kid like me who was forced to play center in rec-league basketball? Or is it a sign that the rules of engagement in the NBA could be changing in the 2020s? Like most questions about the Association, the answer has to be considered in a post-Durant world, that is, how the landscape of the league will look once KD is no longer on the Warriors, as most assume will happen this summer. That’s when things get interesting. I don’t think centers will start dominating the league like they did in the halcyon days of Shaq, Hakeem, and The Admiral. But much like how the last five years have been dictated by the small, the next five could possibly be dictated by the big. The Warriors can’t Warriors forever. Let’s say Durant leaves. How much longer will the Death Lineup set the rules? Teams are already ignoring Draymond on offense. And Andre Iguodala, a key spice in the ingredient list, is no spring chicken. Sooner rather than later, the centers could start being the bullies again. What do you do if your team has no answer for the Jokic-Jamal Murray pick and roll? What do you do if your center can’t chase Embiid on the perimeter while also trading body blows with him down low? (Al Horford, I see you.) We’re already starting to see the effects of this a little bit. There’s a reason the Raptors acquired Marc Gasol at the trade deadline—it’s because they needed a more versatile big body than Jonas Valanciunas. Again, I don’t think centers are going to take over the league, but enough unicorny emergence at the position will force teams to game plan for that position in a way they haven’t since Pau Gasol was on the Lakers. The small ball emergence of the late 2010s really looked like it would slowly choke centers out of the NBA, unless they looked and played exactly like Clint Capela. Instead, the guys who would’ve been strictly back-to-the-basket players only eight years ago have expanded their skillsets to create their own unique set of matchup problems on a nightly basis. The consequences may not be felt this spring and summer—the Warriors are still overwhelming favorites without Cousins—but by the time 2020 arrives, it’s possible that centers, the species recently in danger of going extinct, will have evolved enough to once again be a focal point when it comes to building a contender.